Back in the 60s owning a Burns was really something, Fenders were expensive and difficult to get hold of and for a short time Burns were a force to be reckoned with. Eventually they were taken over by Baldwin organs and shortly afterwards vanished from the scene. (C.B.S had originally made a bid for Burns, Fender was their second choice.) 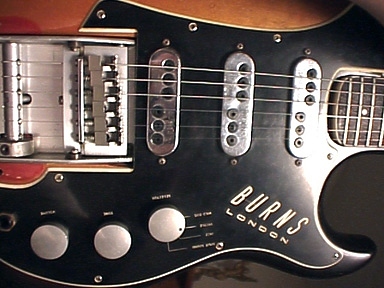 An original Burns had their “Burns London” logo etched into the scratchplate whereas the current re-issues have it screen-printed on the top. After the take over the logo was changed to “Burns by Baldwin”. The top of the range was the Marvin with it's custom trem unit which boasted 34 moving parts in their adverts, the trem had Hank Marvin`s signature etched into it's body. Really this model looked like a large bodied white strat but the neck headstock was of a scroll design similar to a violin. For a while The Shadows used nothing but Burns guitars and Vox amps. Bruce Welch's Marvin was specially made with a slightly narrower neck. The Shadows had two sets of Marvins; the second set being green sunburst, if you come across one of those it is a real collectable instrument. Shadows enthusiast will know that Bruce actually used an acoustic on most recordings and if you are looking for a terrific rhythm guitar player just listen to their recordings between 1960 – 1964. Moving down the range there was the Duo sonic (two pickups,) and the Tri sonic (three pickups). These were Stratish in design but without the scroll headstock. There were also various low-grade models at the very cheap end. Machine heads on these models left a bit to be desired, plus the truss rod was adjusted through the rear of the guitar. (There was a little gearbox mounted inside the neck, which meant that the hexagonal adjustment key was at right angles to the base of the neck. There was a tool supplied with the instrument to fit over this key, loose that and the adjustment became a really tricky job.) There were also bass versions plus the famous “Bison” which resembled an SG but the two horns came right around like two bull horns, hence Bison. Burns also ventured into a copy of the Gibson flying V and a few acoustics and semi`s. I have only ever played one Burns electro-acoustic and although it played ok the body was made with such thick plywood that without being plugged in it was not much louder than a solid bodied guitar. Wild Dog and Split sound. Each pickup was actually two pickups with two separate coils and these were switched via a complex arrangement of the rotary control. So with three double pickups there were six coils to switch, sadly the designers limited the outputs of these to just four options. So, “Wild dog” was actually an out of phase sound with very high treble, “Treble” was the bridge pickup, “Jazz” was the neck and centre pick ups and “Split sound” was a something quite original. The coil under the treble three strings on the bridge pickup was paired with the coil under the three bass strings in the neck pickup. Thus the sound was “split”, the treble strings were very treble and the bass strings very bassy. Actually Gretch once made a guitar with two bass strings and four normal and Chet Atkins made an album with it, just sounded like two separate guitars. These pickups were actually low impedance with a matching transformer built into the instrument. The coils were not wound onto the magnets as in a Fender Strat type design but were wound separately and then placed into the housing around the magnets. Because of this loose design the pickups could be quite microphonic but they do have a sound of their own, Brian May used Burns pickups in the famous guitar he built and plays. Sadly, the quality of the Trisonic wiring left a bit to be desired nothing was screened and the whole wiring loom used to be laced up with a single black cable, which they didn't bother to earth. By any standards it could pick up quite a bit of hum and noise, earthing the lacing cable would virtually cure that. The tremolo unit was quite amazing. The six bridge pieces sat on a plate which itself rested on a roller and could slide back and forth. The trem arm would move the roller, which would move the bridge pieces back and forth, there was a Bigsby type return spring which didn't always bring the bridge to the same place it started. If you can afford one, Burns guitars are a lot of fun, sadly they now attract ridiculously high prices as “collectibles” rather than as a musical instrument.